The President calls "Big Jim" or Jim Justice, Republican governor of West Virginia, up to the stage. "Our economy is booming like never before," the President said. "And by the way, your state is booming like never before," he tells the attendees in West Virginia. West Virginia should be at or near the top of the GOP's targets this cycle based on Trump's 42-point margin there in 2016, and Trump's frequent visits prove they hope to pick it up. But the difficulty for Republicans is they are running against Democratic Sen. Joe Manchin, a popular two-term governor who has demonstrated a willingness to buck his party and support the President's policies and nominees. He voted for Trump's first Supreme Court selection, Neil Gorsuch, and is one of a few senators who support Republican Sen. Jeff Flake's call for an FBI investigation into Brett Kavanaugh's past and now essentially hold the future of his Supreme Court nomination in their hands. Manchin also has demonstrated he can win in a less-than-ideal environment, receiving 61% of the vote in 2012 even as Romney carried the state with 62% support. Republican nominee Patrick Morrisey, the state's attorney general, has faced questions about his fundraising ability and Manchin has a huge cash advantage. Morrisey only recently launched his first television ad, a biographical spot that features praise from the President and highlights his legal challenge to environmental regulations implemented by the Obama administration. President Trump's rally will be at 7 p.m. ET tonight at the Wesbanco Arena in Wheeling, West Virginia. 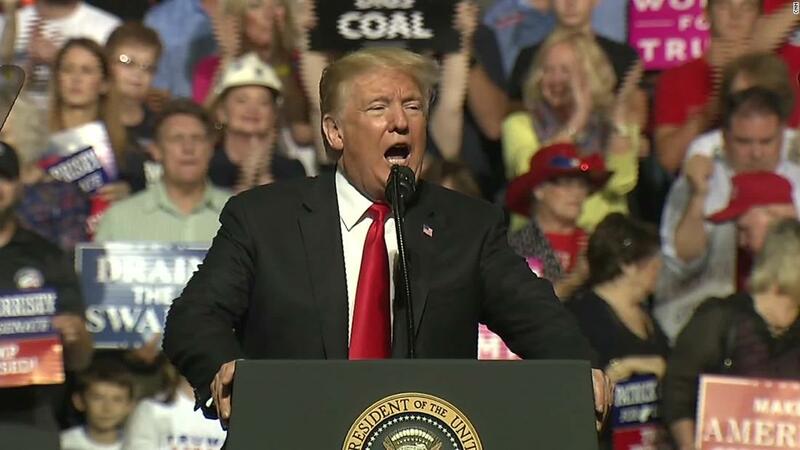 This will be Trump's seventh visit to West Virginia since he took office and his first stop in Wheeling since he first began campaigning, according to CNN affiliate WCHS. He last visited on Aug. 21 when he urged voters to support Republican Senate candidate Patrick Morrisey as he runs against Democratic Sen. Joe Manchin.